We are moving into a new place, so I haven't been out on a trip recently. Here are a couple of interesting photos from past trips. 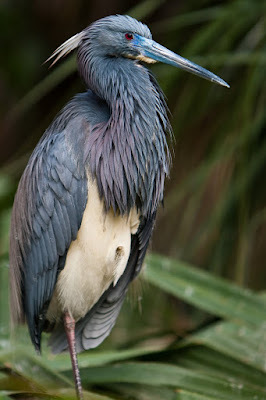 The first is a portrait of a tricolored heron (Egretta tricolor) taken at the St. Augustine Alligator Farm in St. Augustine, FL. While it might look like this is a flash picture, it was taken with only natural light at the end of the day against a dark background. 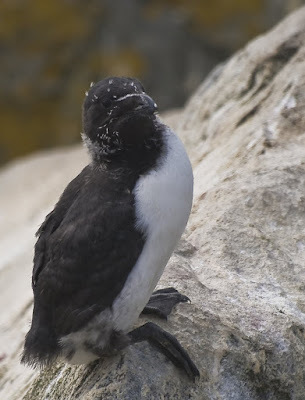 The next is of a fledgling razorbill (Alca torda) chick coaxed out of its burrow by one of its parents on Machias Seal Island in Maine (the ownership of the island is disputed between the US and Canada, but clearly it belongs to the birds). Okay, better posts next time, I spent so much time formatting I need to get to bed. Love the light on the heron! Looking forward to reading your blog!